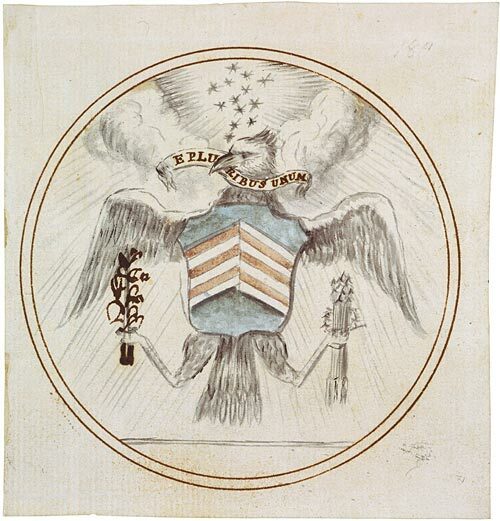 The design of the original Seal of the United States. The design was submitted to Congress on June 20, 1782 and included E Pluribus Unum as the motto. E Pluribus Unum: Out of Many, One. 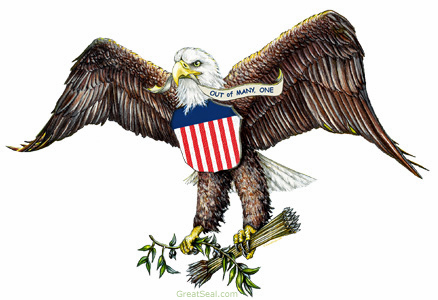 This was not only the motto proposed for the first seal of the United States, but also a phrase that remains on United States’ coins and dollar bills today (McClymer). At surface level, this phrase represents the 13 original colonies—and later states—coming together to form one union. While this interpretation is correct, I would argue it does not address the deeper level of unity in plurality that can be found in the United States: we are many, diverse, independent citizens who all come together to form a national identity. This second, deeper level of “Out of Many, One,” is a common thread in documents crucial to the founding of the United States as an independent republic. In creating the US republic, the founding fathers recalled language from The New Testament. They formulated the principle of unity in plurality by drawing on St. Paul’s vision of the Christian community as the Body of Christ, and equating it with the body politic. In the Declaration of Independence , this concept of the body politic helped to ensure the principle of individual rights and the equality of all citizens. 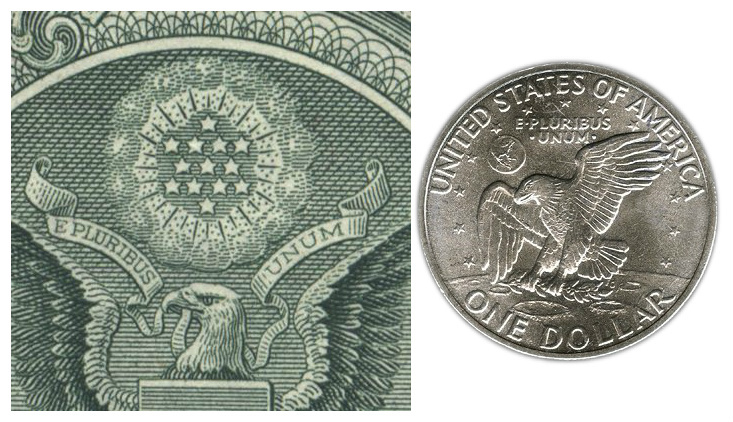 E Pluribus Unum is present on both coins and bills. (New International Version, 1 Corinthians 12.12). The human body consists of many, distinct parts working together to form a cohesive whole. Similarly, Christians are a variety of people all united in a common religious identity. St. Paul called on the Christian Church to act as “one great moral, or if you will, spiritual individual” (M’Chord, 15). Christians are identified by their shared beliefs in certain religious tenets—such as the Trinity, the Resurrection, and the Immaculate Conception. This common belief system unifies Christians and enables them to act as one. Thus, through reliance on the body as a metaphor, St. Paul hoped to emphasize the unity in the Church’s spiritual mission and beliefs. A depiction of St. Paul. The Body of Christ is more than a spiritual metaphor – it also has ties to politics, as St. Paul hoped to strengthen the early Christian Church’s place in the community of Corinth. Corinth was a trading mecca and one of the most important cities in the Mediterranean world (Fitzymer 21). When Corinth was rebuilt by the Romans in 33 AD, Roman colonists became the majority. However, there was still a sizable presence of Greeks, Jews, and immigrants drawn by the city’s wealth. Corinth was also diverse religiously, split between Jews, polytheists of both Greek and Egyptian traditions, and Christians (Fitzmyer 33). The Christian faith was still in its early stages and the Church in Corinth was very recently formed. This Church was built on the shaky coalition of recent converts of a variety of ethnicities and religions. St. Paul hoped to solidify the Christian Church’s place in the community by strengthening the unity of this coalition. Accordingly, the metaphor of a body highlights the necessity to act as one. The metaphor also models the distinct and varied nature of the parts of the human body, just like the diversity among early Christians of Corinth. Just as St. Paul used the metaphor of the Body of Christ to emphasize the shared spiritual identity of the Christian Corinthians, leaders of the United States often use the concept of a body to further a sense of national identity. Analogizing a body to the political sphere is known as invoking the “body politic,” which can be defined as “The people of a nation, state, or society considered collectively as an organized group of citizens” (“Body Politic,” Oxford Dictionary). The concept of the body politic—which parallels St. Paul’s body of Christ analogy in its use of the human body as a metaphor of unity amidst diversity—is central to our understanding of the relationship among the citizens of the United States. We are, quite literally, “an organized group of citizens.” But we are more than a superficial or structural organization. As Americans, we also fall into a common identity and nationality despite our ethnic, geographic, and religious differences. Indeed, Hartz, in his essay The Liberal Tradition in America, writes that America has a sort of “moral unity”— an “Americanism” that we all share (12). This Americanism is a “civil religion,” founded on our shared belief in the values of “individualism, liberty, equality, and property rights” (Citrine I). Our “Americanism” is akin to the Christianity that united the Church in Corinth—early converts and early Americans were both able to create a sense of community through shared belief systems. The human body is a “recurring figure at the very heart of the American imagination,” because it is a metaphor that explains both our individuality and our united identity (Holland XXIV). While individualism is strongly rooted in the American ethic, we still identify together as Americans (Hoover 8). St. Paul did not just use the metaphor of a body to highlight the shared spiritual identity of the Church, but also to further the Church’s development in society through strengthening the unity of its members. Similarly, the founding fathers invoked the body politic to combat their practical worries about divisions among the early Americans. In the 10th Federalist Paper, “The Same Subject Continued: The Union as a Safeguard Against Domestic Faction and Insurrection,” James Madison asserted that the biggest threat to a functioning republic is factions . During the American Revolutionary period, factions were widespread. The colonies were dramatically more ethnically and culturally heterogeneous than any other nation in the eighteenth century, home to “an unprecedented number of peoples” (Butler 11). Benjamin Franklin’s “Join, or Die” cartoon represents the danger of division among the American colonies. This diversity of peoples created practical problems in creating a unified state, such as language gaps and cultural misunderstandings. Benjamin Franklin’s “Join, or Die” political cartoon highlighted the necessity of political unity when combating an outside threat. The founding fathers recognized the reality of the new republic’s divisions. Thus, the appearance of the body politic in the documents of the founding fathers is a reasoned approach to foster unity in order to eliminate the dangers of factionalism. This theme of the body politic is not only referenced implicitly, but also explicitly mentioned in the original draft of the Constitution of Massachusetts, written by John Adams in 1780 . In the Preamble, Adams writes, “The body politic is formed by a voluntary association of individuals; it is a social contract by which the whole people covenants with each citizen and each citizen with the whole people that all shall be governed by certain laws for the common good.” St. Paul expanded the notion of the Body of Christ from a purely spiritual interpretation to a political purpose as he attempted to unify the members of his divided church and thereby secure the future of the Christian Church in Corinth. John Adams adopted St. Paul’s body metaphor and further extended the analogy in the political sphere, as he hoped the image of a body would aid in the unification of the citizens of Massachusetts. The expanded, political nature of the body politic is also apparent in the Declaration of Independence. Jefferson repeatedly used “we”—a bold statement considering that at the time of publication, there was no distinctively American “we” to speak of. Jefferson hoped that his use of “we” would foster a political unification with the new nation as “the basis for our union” (Harrison 100). But this sense of unity was distinct from united empires of the past. Previously, autonomous states had legislated and maintained forms of absolute unity to create security. In these autocratic governments, unity required complete subservience and repression of the individual in favor of the collective unit. By contrast, America is not only a unified territory, but also a free, equal, and diverse people. In other words, the American republic allows for plurality. Hannah Arendt gives us a definition of this specifically human plurality, claiming, “No human life, not even the life of the hermit in nature’s wilderness, is possible without a world” that “testifies to the presence of other human beings” (The Human Condition 22). To be human is to live among and with others. In fact, Arendt claims that our only “specifically human quality” comes from our actions that are “entirely dependent upon the constant presence of others” (The Human Condition 22-23). In order to act, we must first possess the freedom needed to interact with others as distinct individuals. Since, “freedom and sovereignty are so little identical that they cannot even exist simultaneously,” we know that in order to have the freedom needed to act in a human way, we need a society that embraces the plurality of individual opinions (Between Past and Future 163). America, as conceived by our founding fathers, is not a sovereign tyrannical nation, but a nation built on the pillars of freedom of speech and thought through the Bill of Rights . The American government embraces human actions in the social sphere. There is plurality—the opportunity for debate among varied opinions—in our unity. This plurality contrasts with previous empires, as the United States cannot be reduced to one collective unit. The body is an accurate analogy for the American political system because the United States of America can only achieve its full potential when individual citizens work together to form that united government. This combination of unity and plurality is highlighted in Jefferson’s Declaration of Independence. Through reliance on St. Paul’s body of Christ metaphor, Jefferson not only emphasized the necessity of unity, but also showed that political unity can occur in a diverse, individualistic, and free community. Jefferson demonstrated the importance of the individual through the assertion of the equality of citizens and his emphasis on the individual rights of all. The equality of man was an idea that had rarely been implemented in preceding history. Since this “truth” is so rare, it’s difficult to understand how it can also be “self-evident,” unless Jefferson was not relying on historical precedent, but instead drawing conclusions from Christian doctrines (Harrison 99). Yet, according to St. Paul, we are not just created equal, but we also maintain this equal importance throughout our lives. St. Paul used the image of a body to convey that, no matter the exact job—priest, missionary, or simply believer—every Christian’s role was equally important in sustaining the Christian Church. Again, St. Paul used the body as a metaphor: “If the whole body were just an eye, how would there be any hearing?” (1 Corinthians 12.17). The consideration of individuals as equally important despite their differences marks a tenet in American politics that transformed the public sphere, exalting the common man and calling politicians to cater to all citizens rather than just to the elite. America was founded without a class of nobility, instead fostering a community in which men were treated as equals. The rejection of nobility was first invoked when the founding fathers and early leaders acted as citizens rather than as elite leaders. Democracy, as it is defined in the United States’ government, is a system where “the government represents the people and governs on their behalf. In this sense everybody, whether a president, member of Congress, member of the city council, or a voting citizen, bears political responsibility and political office” (Marshall 72). When Jefferson invokes the “we” in the Declaration of Independence, he is not just speaking as “we the representatives” or “we the founding fathers” but as “we the people.” Jefferson overtly invokes the “the good People of these Colonies” as the “authority” for the United States’ right to independence. Jefferson, like St. Paul before him, asserted the importance and the distinctiveness of every individual, laying foundation for the principle that not just politicians govern. From the very beginning of the United States, every citizen could take part in governance through voting. The Body of Christ analogy also inspired the call for individual rights in the Declaration of Independence. Once Jefferson accepted our equality as truth, he necessarily had to accept that we also held equal rights. When individuals, for instance peasants, are considered disposable, it’s easy to take away their rights in the name of a united, secure state. But when these individuals are given equal value and worth to even the most important government official, then their rights are tied to the rights of all. Thus, the Body of Christ analogy not only served to combat the inequality that plagued the rest of the world, but also was the impetus for the Declaration’s protection of individual rights. In fact, the concept that we possess natural rights is based on the very belief that God created us. St. Paul states, “there are different kinds of gifts, but the same Spirit distributes them” (1 Corinthians 12.4). St. Paul’s beliefs were shared by the founding fathers, who “believed humans’ rights were not something that people gave themselves, but that they were given by their Creator” (Marshall 78). We see textual evidence for this claim in the Declaration of Independence, as rights are described as “endowed” by God. (1 Corinthians 12.22). Reaffirming the importance of the marginalized in the new Christian community of Corinth served to eliminate cause for rebellion or dissatisfaction. St. Paul used the body of Christ analogy to protect minorities among the early Christians and to ensure a community of unity rather than one of conflict. He called for a greater “honor” given to the marginalized in society in order to secure the equality of all. Similarly, the United States Constitution developed a careful system of checks and balances, one that could protect minorities from the popular will. In a direct democracy, there is no guarantee that the popular majority will not choose to do something violent or something that will infringe on other citizens’ rights. In contrast, the Declaration of Independence asserts that governments derive their “just powers” from the consent of the people, evidence that “even popular consent cannot give a power that is inherently unjust-that is, one that undercuts the rights of those who consent” (Marshall 71). Our Declaration avoids the pitfalls of a direct democracy that places all the power in the hands of a majority, instead invoking the power of justice as a higher authority than the power of the popular support. Martin Luther King, Jr. giving his famous “I Have a Dream” speech. The impact of the Body of Christ, and therefore the body politic, in achieving equal rights for minorities is demonstrated through the Civil Rights Movement of the 1960s. St. Paul, in describing the Body of Christ, wrote, “If one part suffers, every part suffers with it; if one part is honored, every part rejoices with it” (1 Corinthians 12.26). The parts of a body are all connected, thus pain or misfortune of one part translates to pain across all parts. In the 1960’s, the risk of division in the body politic had become problematic for national unity. Racial tension was at a peak and African American citizens began publicly asserting their desire for equal rights. 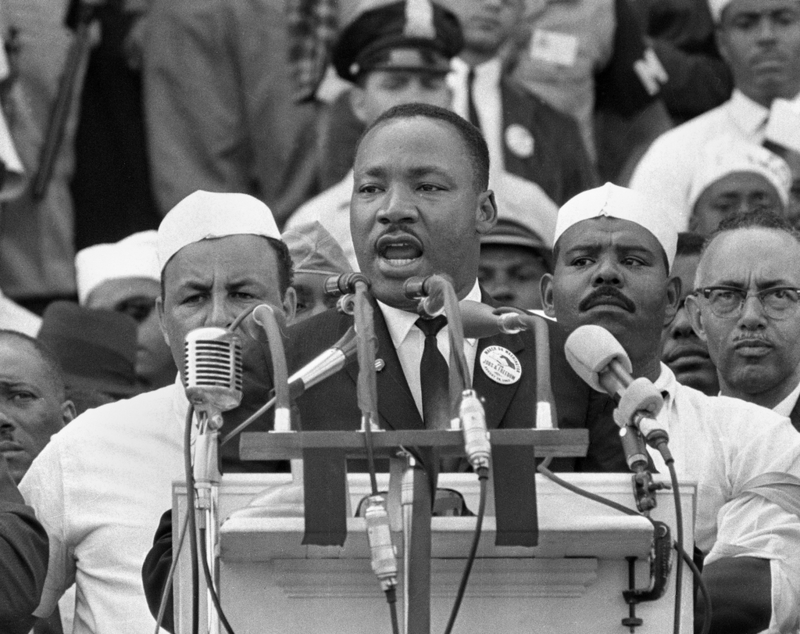 In this moment of crisis, Martin Luther King, Jr. drew from Body of Christ metaphor in his 1963 “I Have a Dream” speech, as he called white Americans to take action on behalf of the marginalized black community. He proclaimed that the people of the white, privileged class “have come to realize that their freedom is inextricably bound to our freedom.” Martin Luther King called for all Americans to act in solidarity to ensure the equality and rights of all. Freedom for some is not enough, as the body cannot function unless all of its parts are working together. Arendt, Hannah. Between Past and Future; Eight Exercises in Political Thought. Enl ed. New York: Viking Press, 1968. Print. Arendt, Hannah. The Human Condition. Chicago: University of Chicago Press, 1958. Print. Charles R. Walgreen Foundation Lectures . “Body Politic.”: Definition of in Oxford Dictionary (American English) (US). Oxford Dictionary. Press, n.d. Web. 11 Dec. 2014 <http://www.oxforddictionaries.com/us/definition/american_english/body-politic?q=body+politic&searchDictCode=all&gt;. Butler, Jon. Becoming America : The Revolution before 1776. Cambridge, Mass. : Harvard University Press, 2000. Print. Citrin, Jack, and David O. Sears. American Identity and the Politics of Multiculturalism. New York, NY: Cambridge University Press, 2014; 2014. Print. Cambridge Studies in Public Opinion and Political Psychology . Fitzmyer, Joseph A. First Corinthians : A New Translation with Introduction and Commentary. 32 Vol. New Haven; London: Yale University Press, 2008. Print. Anchor Yale Bible. Harrison, Robert Pogue. Juvenescence: A Cultural History of our Age. University of Chicago Press, 2014. Print. Hartz, Louis. The Liberal Tradition in America; an Interpretation of American Political Thought since the Revolution. 1st ed. New York: Harcourt, Brace, 1955. Print. Holland, Catherine A. The Body Politic : Foundings, Citizenship, and Difference in the American Political Imagination. New York: Routledge, 2001. Print. Hoover, Herbert. American Individualism. 1st ed. Garden City, NY: Doubleday, Page, 1922. Print. King, Martin L., Jr. “I Have a Dream.” Speech. Lincoln Memorial, Washington, D. C. 28 Aug. 1963. American Rhetoric. Web. 11 Dec. 2014. Marshall, Paul A. God and the Constitution : Christianity and American Politics. Lanham, Md. : Rowman & Littlefield, 2002. Print. M’Chord, James. The Body of Christ. Lexington, Ky.: Thomas T. Skillman, 1814. Print. McClymer, John, and Lucia Knoles. “E Pluribus Unum.” The E Pluribus Unum Project. Assumption College, n.d. Web. 27 Nov. 2014. <http://www1.assumption.edu/ahc/&gt;. New International Version. Colorado Springs: Biblica, 2011. Web. 11 Dec. 2014 <https://www.biblegateway.com/&gt;.